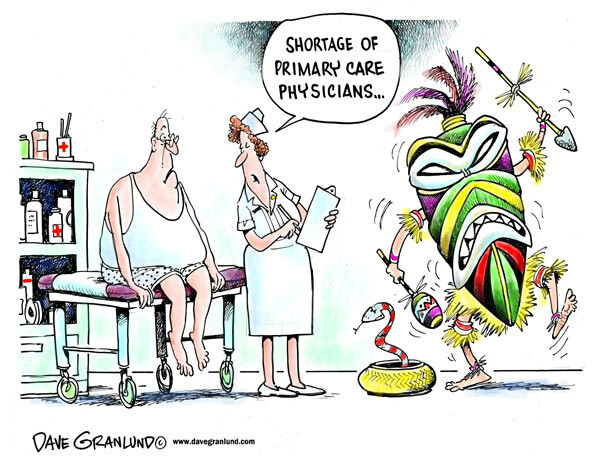 It would be “free” only in nominal terms to the patient, and greatly degraded. The gap between the need for health care and the available supply cannot be solved via “conscription” of providers. And caring for the sick is one thing, but granting a “right” to well-care or health maintenance makes the gap much larger. Inadequate compensation to providers is an important subtext here, and it goes to the heart of the conflict. Basic economics tells us that the gap in access will expand if buyers are subsidized and providers are penalized by artificially low prices. The expanded eligibility for Medicaid in many states under Obamacare only exacerbates shortages, as physician reimbursements remain generally low. Obamacare may have improved access to health care for a small minority of individuals, but only at the expense of penalizing many others, including providers. The program has fallen far short of its goal of covering the uninsured and has failed to “bend the cost curve” (despite false claims to the contrary, which attempt to take credit away from the Great Recession for slowing costs). Obamacare still looks to be unsustainable, as many have predicted. Insurers are now seeking large rate increases in many states, and going forward, they will not have the cushion of government-funded “risk corridors” when premiums fail to cover claims. A Supreme Court ruling in the King v. Burwell case is due next month. The case has been discussed on this blog twice this spring. The plaintiffs have challenged federal subsidies in states relying on federal insurance exchanges in direct contradiction to the “plain language of the law”. The subsidies were intended to be an inducement to states to set up their own exchanges, but a number of states chose not to do so. A ruling for the plaintiffs would severely damage the Obamacare program, since the subsidies are key to making the relatively extravagant mandated coverage affordable to low-income individuals. However, Joel Zinberg insists that ending federal subsidies will not cause a death spiral. Still, such a ruling would seem to give Congress and the Republicans an opportunity to craft legislation to replace Obamacare with a more viable program. Republicans seem have been unable to craft a strategy for dealing with this contingency, but their best strategy might be to wait, pass an extension of subsidies until 2017, and dare Obama not to sign it into law.